Vacationing Artfully on the Emerald Coast. 2016 Foo Foo Festival. Whether it’s been promoting Pensacola as an arts and culture destination, including two familiarization trips with media, or executing digital initiatives to raise awareness, DEVENEY offered strategic counsel to implement Foo Foo’s core objectives. In its third year, Foo Foo Festival hired DEVENEY to promote the festival by creating buzz around the arts, culture and food offerings of Pensacola during the off season. Our charge was to secure regional trade + consumer media, garner media coverage in advance of and following the events, and increase attendance. Employ efforts that would drive media coverage, encourage attendance and build anticipation of Foo Foo Festival 2016. Plan and implement extensive media relations, calendar listings and familiarization (FAM) trips. 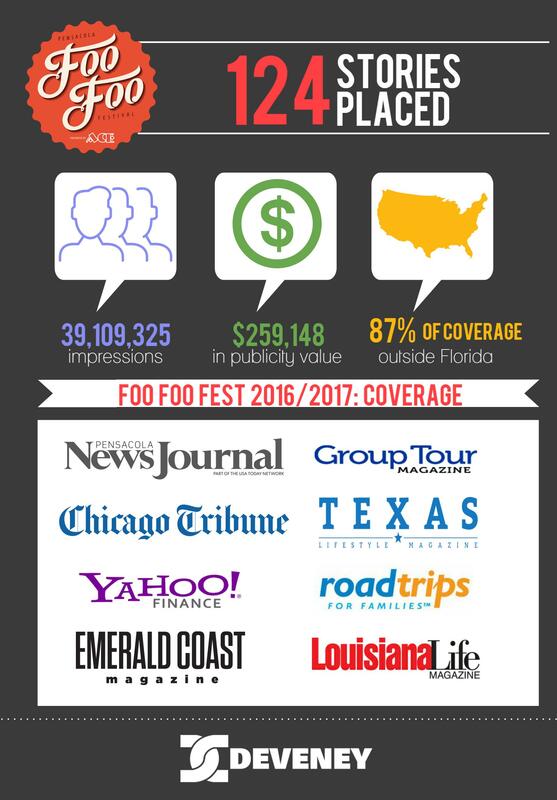 Obtain advance coverage – DEVENEY coordinated with writers in the Gulf South region to share news of the festival and promote advance coverage, in particular with the Pensacola, Mobile and New Orleans markets. Generate calendar listings – DEVENEY distributed festival dates and details to over 100 outlets and contacts. Facilitate FAM Trips – DEVENEY planned and implemented two visits to pique editorial interest and position Foo Foo Festival as a not-to-be-missed cultural attraction in the fall.